with the Best Board-Certified Endodontists in Orange County! In the past, if you had a tooth with a diseased nerve, you would probably lose that tooth. Today, with a special dental procedure called "Root Canal Therapy or Endodontic Therapy", your tooth can be saved. This therapy is one of the most common dental procedures performed, well over 15 million every year and 41000 per day. The Root canal therapy is needed when inner nerve and pulp, which is the center of your tooth become infected by trauma to the tooth, deep decay, cracks and chips. Root canal therapy is a simple non-surgical treatment that can save your natural tooth and retain even the most severely damaged tooth while relieving your symptoms such as visible injury or swelling of the tooth, sensitivity to temperature, or pain the tooth and gums. Although people fear root canals, the truth is that this procedure does not cause pain, it eliminates it. Our professional team at Aria Dental are dedicated providing you pleasant and comfortable experience each time you visit our office. To learn more about root canal treatment, we welcome you to call (949) 364-9600 or in Mission Viejo today for an appointment with the top American Board-Certified Endodontist of Orange County. It is a procedure where a badly decayed or fractured or dead tooth is saved by removing its soft part (pulp) from the crown and the root of the tooth. Pulp is in the core of the crown and root of the tooth. At the center of your tooth beneath the white enamel and hard layer of dentin is soft tissue called pulp. Pulp is a collection of blood vessels, nerves, and connective tissue, which help growth of your tooth during its development. A fully developed tooth can survive without pulp because the tooth continues to be nourished by tissues surrounding it. Infection of pulp can be caused by trauma to the tooth, deep decay, cracks and chips, or repeated dental procedures. The root canal therapy is often recommended if the tooth pulp and nerves become infected or damaged. This may occur if injury or decay reaches deep into the tooth, past the outer enamel layer. When left untreated, this type of infection and disease may cause the tooth to die and necessitate tooth extraction. To restore the health of the tooth and avoid the need for extraction, our skilled dentists and American Board-Certified Endodontist will remove the infected and injured tissues from within the tooth, clean the tooth, and fill it with a medicated material. We will then cap the tooth with a restoration, such as a dental crown, to return the tooth to its original shape and structure. Why Need Crown After Root Canal? A DEEP INFECTION: Root canal treatment is needed when an injury or a large cavity exposes the tooth's pulp and root becomes infected or inflamed. ROUTE TO REACH THE PULP OF THE TOOTH: An opening is made through the crown of the tooth to the Pulp Chamber. REMOVING THE INFECTED TISSUE: Infected or inflamed tissue is removed; Canals cleaned. FILLING THE CANALS: Canals filled with a permanent insert rubber material, called Gutta-Percha cones. This helps to keep the canals free of infection or contamination and fills the dead space. REBUILDING THE TOOTH: Opening sealed with temporary filling materials. In some case, a post is inserted for extra support. CAPPING OF THE ROOT CANAL TREATED TOOTH WITH A CROWN: New crown cemented onto rebuilt tooth. No. Modern endodontic treatment is nothing like those old saying! It’s very similar to a routing filling and in most cases, a root canal can be completed in two comfortable visits to Aria Dental. Getting a root canal is relatively painless and extremely effective. You’ll be back to smiling, biting and chewing with ease in no time. Success of this type of treatment occurs in about 85% to 97%, depending on circumstances. If your tooth is not amenable to endodontic treatment or the chance of success is unfavorable, you will be informed at the time of consultation or when a complication becomes evident during or after treatment. We use local anesthesia to eliminate discomfort, but we also offer distinct types of sedation such as Nitrous Oxide and Oral sedation. 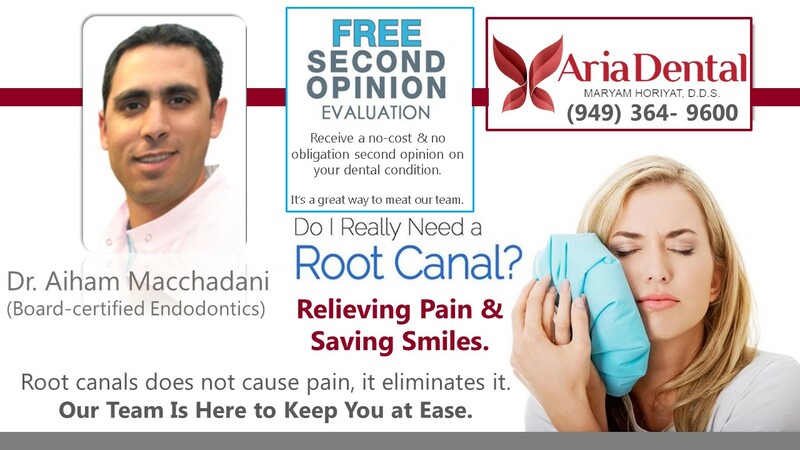 At Aria dental, we only utilize the latest in advanced dentistry techniques and equipment that will help to make our endodontics procedure quick, effective, and as comfortable as possible. In endodontics, accurate treatment is not only dependent on the technical skills and knowledge of the dentist, but also on clear, detailed visualization of the surgical field. As the outcome of an endodontic therapy is influenced by many factors that are not visible to the naked eye – e.g. additional root canals or anatomical variations – the high magnification and illumination provided by a dental microscope has become indispensable for both diagnosis and therapy. Today, it is widely agreed that the use of dental microscopes has helped to extend endodontic treatment potential. A dental microscope such as the Leica M320 can provide significant visualization benefits at all stages of endodontic treatment, from diagnosis and exposure of the access cavity to preparation, and from three-dimensional obturation to post endodontic management. High magnification, large depth of field and bright, coaxial illumination of the surgical field can reveal fine details, helping the dentist to manage difficult cases with increased precision. With the appropriate care, your teeth that have endodontic treatment will last as long as other natural teeth. If a root canaled tooth fails to heal and pain continue to occur, the endodontic retreatment may be needed. What is an Apicoectomy? Apicoectomy also known as root-end resection is a minor surgical procedure performed with your endodontist in Aria Dental. This surgery is performed when inflammation or infection persists in bony area around the end of your tooth. It also can be used to locate fractures or hidden canals that do not appear on X-rays but still manifest pain the tooth. To perform Apicoectomy, an incision is made in the gum tissue to expose the bone and surrounding inflamed tissue. root tip or apex is removed along with infected tissue. Finally, a filling is place to seal the end of the root. DISLODGED TEETH: If injury to the mouth causes teeth pushed back into their sockets or pushed partially out of the socket, you need to go to Aria Dental for an emergency dental care. 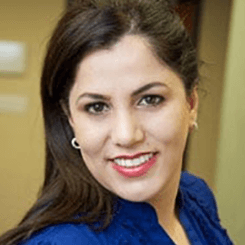 Your expert dentist, Dr. Maryam Horiyat at Aria Dental may reposition and stabilize your tooth. If the pulp becomes damaged or infected, your endodontist, Dr. Macchahdani, may perform root canal treatment few weeks after your injury. The root canal treatment may be started by placing medication such as calcium hydroxide inside the tooth prior to implementing of permanent root canal filling. AVULSED TOOTH: If an injury caused a tooth to be completely knocked out of your mouth and displaced from its socket, it is important to immediately replanted for best possible prognosis. In this situation, immediately call Aria Dental for an emergency dental care. The success of delay replantation depends on the vitality of the cell remaining on the root surface. Thus, it is important to keep the tooth moist. 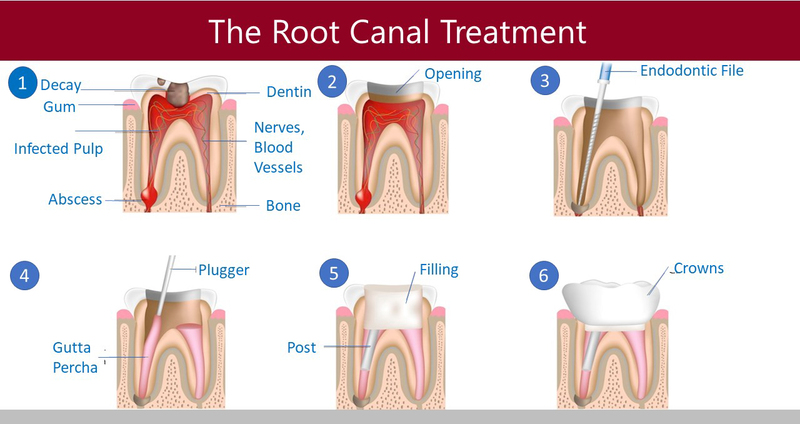 Your endodontist may start root can treatment based upon the stage of root development. Aria Dental has state-of-the-art dental equipment with skilled, precise, caring, and experienced Root Canal Specialists! We are located in center of Orange County, CA in the City of Mission in proximity of many other cities of Orange County like Ladera Ranch, Laguna Hills, San Juan Capistrano, Nail Gail, San Clemente and more. We see patients coming from North Orange County all the way to San Diego County. We welcome you to our modern dental practice where you receive an excellent service for general and cosmetic dentistry to all board-certified specialties under one roof.